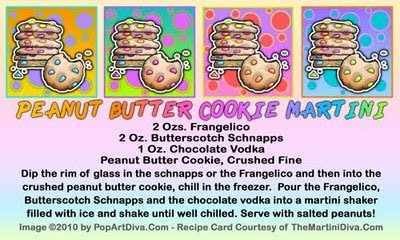 The rich taste of a peanut butter cookie gets translated to a cocktail in this Peanut Butter Cookie Martini Recipe. The key to the whole taste is the Frangelico, a hazelnut liqueur, which brings the nutty taste, and the butterscotch schnapps which gives the depth of the dough's flavor. If you can get a hold of it, Castries Peanut Creme Liquor has a much closer peanut taste but the Frangelico will do in a pinch.